Let's start with a sweet royal love story that is feeling very poignant right now following the sad death of the handsome prince who starred in a very famous June royal wedding. Queen Margrethe II of Denmark was still a princess and heiress presumptive to the throne of Denmark when she married French diplomat, Henri Laborde de Monpezat, at Holmen Church in Copenhagen on June 10th 1967. The daughter of King Frederik IX and Queen Ingrid said 'I do' in a ceremony attended by royalty from around Europe. Less than five years later she became Queen of Denmark on the death of her father. Margrethe and Henrik had two sons and eight grandchildren. Prince Henrik died earlier this year at the age of 83 and his widow will mark her first anniversary without him later this month. Sophie Rhys-Jones became a royal bride on June 19th 1999 at St George's Chapel, Windsor when she married the fourth child and youngest son of Elizabeth II and the Duke of Edinburgh. Prince Edward was made Earl of Wessex just before the ceremony. There were royal guests but overall, this was a relatively low key wedding for the House of Windsor. The Earl and Countess of Wessex have two children, Louise and James. This royal wedding might well be fading into history now but at the time it was a truly glittering event that attracted attention from around the world. Katherine Worsley, daughter of Sir William Worlsey and his wife, Joyce, became a royal duchess when she married Edward of Kent in front of royalty from around Europe at York Minster on June 8th 1961. The couple went on to have three children and ten grandchildren. Perhaps one of the most famous royal weddings ever took place on a hot June day in France. Bessie Wallis Simpson, nee Warfield, married the King Emperor who had given up ruling half the world to make her his wife. The romance of Edward VIII and Wallis Simpson is about as well known as royal love stories come. The Abdication of December 1936 when he signed away his throne for the woman he loved is still one of the most pivotal events in royal history. The couple wed at the Chateau de Cande near Tours with Wallis in blue and a few formal posed photos released later. She became a duchess but not an HRH. The couple had no children. Edward died in 1972 and Wallis in 1986. Another controversial royal bride was Marie Christine von Reibnitz who became a cousin in law of the Queen on June 30th 1978 when she married Prince Michael of Kent in a civil ceremony in Vienna, Austria. Marie Christine had been married and divorced and she was also a Catholic, meaning her husband lost his place in the line of succession on their marriage. The couple has two children and two grandchildren and Prince Michael was restored to the line to the throne following the Succession to the Crown Act 2013 - he holds place 45. The youngest daughter of Queen Juliana and the baby sister of former queen Beatrix became a royal bride in the historic city of Utrecht on June 28th 1975. But Christina of the Netherlands had already renounced any right to succeed to her country's throne and given up the same rights for any future children to avoid any questions that might be raised by her marrying Catholic Jorge Perez y Guillermo. Christina had already converted to her new husband's faith and after their wedding they lived in New York and the Netherlands, Christina and \Jorge, who divorced in 1996, have three children. Another controversial royal June wedding took place in 1978 when Princess Caroline of Monaco, eldest child of Prince Rainier III and Princess Grace, wed Philippe Junot, a French banker sixteen years her senior. The wedding was a glittering event, held in Monaco with a civil ceremony on June 28th and a religious one the following day. Caroline and Philippe, who had no children together, divorced in 1980 and the marriage was annulled in 1992. Rania of Jordan was a graduate with a burgeoning career when she met the then Prince Abdullah of Jordan. They married on June 10th 1993 in Amman and when he became King Abdullah II of Jordan in 1999 on the death of his father, King Hussein, he proclaimed his wife queen. Rania and her husband have four children and the Queen of Jordan has a high profile through her campaigning work. The list starts with a queen and ends with one, both married on June 10th. 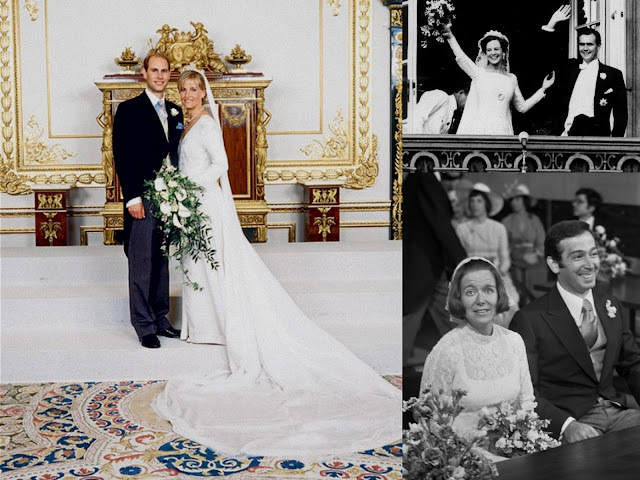 Royalty and royal history is filled with June brides - a perfect month for a monarchical marriage.